Photons have no mass, but they do have momentum. So along those lines, researchers can do counterintuitive things with photons, such as using light to push matter around. A group of scientists led by chemist Gordon Shaw at NIST’s Physical Measurement Laboratory (PML) has been taking advantage of this property to develop devices that can create and measure minute forces, an area traditionally underserved by the metrology community. The official SI unit of force is the newton. One newton is equivalent to about the weight of an average-sized apple. The experiments the group is working on can measure forces that are tiny fractions of a newton – from micronewtons (10-6, millionths of a newton) all the way down to 15 femtonewtons (10 -15, a million billionth of a newton), at the level of atomic interactions. A piconewton (10-12) “will stretch a DNA molecule out,” Shaw said. The PML team is currently developing two types of force-measurement devices that use laser light to reliably create small forces. The first is a chip-sized sensor that can use micro- to milliwatt- power light. The second is a tabletop contraption designed for laser light of about 1 watt, but which could potentially end up developed for light of tens of kilowatts of power. Eventual commercial uses could include sensors that use laser light as a built-in reference, allowing scientists to ensure their devices really are measuring force correctly. But the potential applications go beyond force, into cheap field-portable balances for near-instant measurement of masses of a milligram or less, and into compact laser power meters that make their measurements in real time. The smaller of the two types of force meter being developed by the team is a chip-sized sensor made of fused quartz. It consists of a small cantilever – a miniature diving board – less than 1 cm in length. The bigger the force, the more the cantilever moves. A built-in interferometer acts as a motion sensor. Physically pushing the diving board is one way to apply a force for measurement. But researchers also need to gauge the sensitivity of their sensor. And the best way to measure sensitivity is to apply a well-known force to the cantilever and see how the interferometer interprets it. To manipulate the cantilever with light, they fit it with a highly reflective, gold-coated surface that can reflect light shining on it from an optical fiber. When this light hits the gold surface, it transfers its momentum to the cantilever, which begins to vibrate. Top photo: Gordon Shaw with the Electrostatic Force Balance (EFB). In the bottom photo, a close-up of the front of the EFB. The gold-colored cylinder (lower center) is the capacitor. Applying a force to the balance causes the rectangular flexure (center, above capacitor) to move. The capacitor’s inner electrode is attached to this flexure. Researchers can measure small masses by placing them in the small copper-colored, hook-shaped pan at the top of the instrument. “If you think of a tuning fork, you can hit it and it will ring at a particular frequency or a particular tone. This does the same thing,” Shaw said. They found if you reflect laser light off the surface, there’s a relatively straightforward way to calculate what the force should be based on the laser power. The higher the power, the more photons there are, and the larger the force that’s generated. Furthermore, since the cantilever’s resonant frequency changes almost instantly if a mass is placed on it, the mechanism could also be used as a very sensitive balance – particularly for objects that are extremely valuable or dangerous. For example, jewelers could use it as a less expensive alternative for weighing and pricing gemstones. It could even be used potentially as a field-portable, disposable tool for measuring samples of hazardous materials. Variations on this design could also end up used to improve calibrations of atomic force microscopes and even to measure laser power. 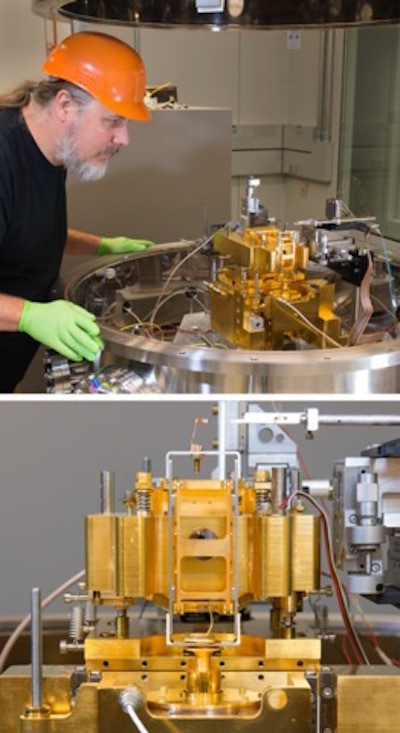 Unlike the current “gold standard” method of measuring laser power – a cryogenic radiometer – a chip-based laser power meter like this can be used at room temperature and in real time. But even at the lowest laser powers they have used so far – just millionths of a watt – the light still contains an enormous number of photons. Someday, Shaw said, he hopes to develop a force measurement device capable of single-photon detection. The reason is that integers don’t have uncertainty; if you count individual photons, and you know how much force each photon produces, then you can calculate the force. “It’s potentially the most precise measurement of force, if we can count them accurately,” Shaw said. The proposed scheme would require measuring mere zeptonewtons of force (10 -21) which translates to 100 million photons per second – “about as much as you can count,” Shaw said. However, he said, they are not nearly there yet. And it’s going to take a while. For one thing, they have to figure out how to cool the single-photon force sensors down to just fractions of a degree above absolute zero, which requires a cryostat. But, as they learned the hard way, a typical cryostat creates too many vibrations for such precise measurements – a factor of 10,000 more than they could accept. While they prepare to test their prototype in a new, less shaky cryostat design they’ve turned the vibration issue into a potential solution for a different problem. The team is working on experiments that use the forces created by higher laser powers – potentially as high as tens of kilowatts, like those used for industrial applications such as welding and cutting metals. The experiment, which is currently designed for a 1-watt laser, uses a tabletop device called the electrostatic force balance (EFB). Like its chip-sized cousin, the EFB relies on a highly reflective mirror and a laser to create a force to be measured. But instead of using an interferometer, the EFB measures electrostatic force generated by a capacitor, whose plates are two concentric cylinders. In vacuum, the researchers reflect a 1-watt laser off the mirror, then measure that force electronically using the capacitor. As with the smaller sensor, the laser light used in these measurements is not lost: It bounces off the mirror and – in theory – could end up used directly in a laser machining process on a factory floor. Shaw said it’s exciting to be able to use essentially one physics principle for accurate measurements of force, mass, and laser power across such a large range, from milligram-scale objects to atomic interactions. “Because this is still in the basic research phase, there’s a little room to develop new methods and think about things in a different way,” he said.